How bad is the sea-level rise? Though scientists debate the severity, a new study says at least 316 U.S. cities and towns will be mostly submerged unless pollution can be pulled from the sky. A rise in sea levels threatens the viability of more than 1,400 cities and towns, including Miami, Virginia Beach and Jacksonville, unless there are deep cuts in heat-trapping greenhouse gas emissions, says an analysis out Monday [29-Jul-2013]. Prior emissions have already locked in 4 feet of future sea-level rise that will submerge parts of 316 municipalities, but the timing is unclear and could take hundreds of years, according to the paper in the Proceedings of the National Academy of Sciences. 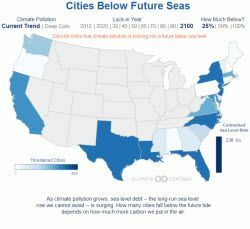 If global warming continues at its current rate through the year 2100, at least an additional 1,100 cities and towns will be mostly under water at high tide in the distant future.